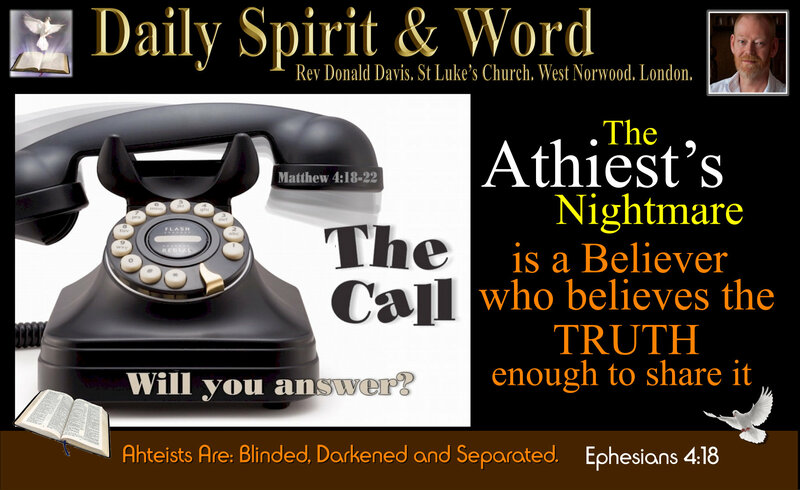 Daily Spirit & Word: 723: The Atheists’ Nightmare. 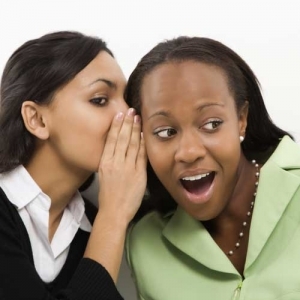 Is a Believer and Follower of Jesus, who knows the Truth and believes it enough to begin to share it. Last Wednesday evening we met an Atheist, he was one of the most intelligent and polite men I’ve met in a very long time. We have a little intelligence test, David went through all our trick questions and the Atheist got them ALL correct. There was no way we were going to fool this man. But it brought a smile to his face and warmed his heart. He loved debating. On Sunday evening we attended a little session on putting on the Gospel Armour: You know the song, “Each Piece Put ON With Prayer”… i.e. we’re not to mechanically or ritualistically put the armour on. Ephesians 6:10-20. This DARK WORLD: the rulers, authorities and powers of this dark world: These are the people empowered by SATAN: The battle is not against those people, but the SPIRIT and EVIL that’s empowering them. They don’t even know it, they are unaware of it, they are DARKENED in their understanding. Ephesians 4:18 and BLIND to their condition, 2 Corinthians 4:4. AND: The Spiritual Forces of EVIL in the HEAVENLY REALMS: i.e. Satan and all his demonic army. We can have ‘nice’ debates with people, we could get into logical arguments, but in the end it’s the LIGHT of Jesus Christ they need, not to be won over by argument. I keep repeating this little phrase to myself when engaged in debate, “Win an argument and you loose a friend”… We’ve just taken time to build friendship with that man or woman (be it only for a few minutes), so why ruin that hard won friendship by winning an argument? Let him win, let her win, then move onto the Gospel. I’d much rather loose a debate and win a soul for Jesus Christ. WHY? Because they’ve been blinded by Satan. They’re darkened in their understanding (they just don’t KNOW they are in the darkness, they a also Blindly Unaware) so just give them some awesome, bright, shining light. Let them see again, we can SOFTEN any heart with Jesus POWER. And we can bring LIGHT of understanding to any soul. Take them by the hand and lead them out of their dreadful darkness, guide them into the light, usher them into the presence of Jesus Christ. YBH: “Yes, but HOW?” There is POWER in Gospel Words. 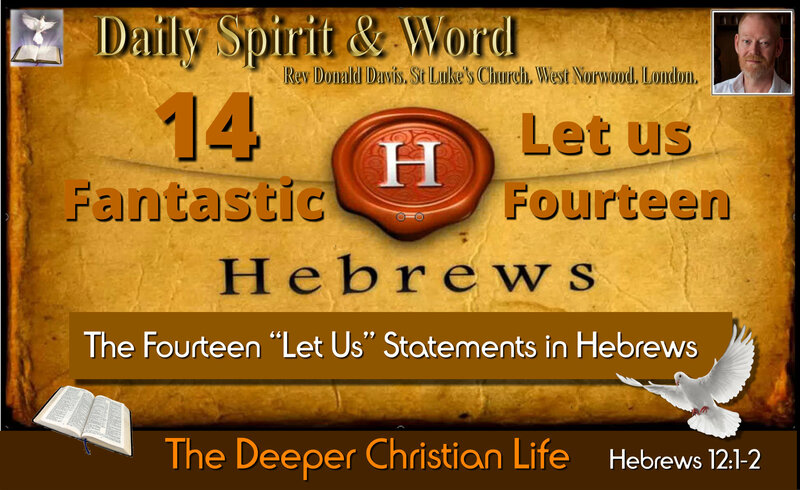 The message is heard through the WORD OF CHRIST. (THE WORD OF GOD). AND: FAITH comes by hearing that message. Sometimes it is almost physically observable when I see a person getting the LIGHT: When sharing the good news every week, we’ll observe the moment when the LIGHT goes on in a person’s soul. Suddenly they get it! I’ve been watching the physical reactions when we go through God’s LAW: A man suddenly puts his hand over his mouth. It’s like he’s got to stop trying to justify himself. A woman’s eyes well up with tears and she just goes silent for a few moments, then declares, “So we’re all sinners, we’re all doomed”… It’s such a wonderful moment when someone is brought into the light of understanding and knowing. SEPARATED FROM THE LIFE OF GOD. They are not just DARKENED and BLINDED, they are SEPARATED from the life of God. They are also SEPARATED because of the ignorance in them, due to the hardening of their hearts. We got some dried mushrooms the other day, to be able to use them, we had to soak them for hours in water. It’s amazing watching those mushrooms go from dried up crisps and return to the fattened shape and form again. I’ve heard some people say “My husband’s heart must be like granite (Granite has unyielding firmness, it’s impervious to water)” Granite can’t be penetrated by water that’s why so many people choose granite for worktops in their kitchens. However, no human heart is so hard that it cannot be penetrated with the WORD of God. It goes past the outer surface and penetrates right to the core of the soul. My friends, it’s not that they have hearts that are too tough or hard, but it’s US (Believers and Followers of Jesus) who don’t have enough faith in the POWER of God’s Word to do it’s WORK. Just believe in the power of God’s Word. Accept that when you are sharing Jesus, He’s already beginning to draw that soul from darkness into His marvellous light. We are never working alone, the POWER of Jesus is working right with you the moment you open your mouth to share the Good News with someone, Jesus is beginning to work on their hearts. KNOW THE TRUTH (Jesus) AND THE TRUTH WILL SET YOU FREE. It’s not just the Darkened, Blinded and Separated sinner who needs to know the TRUTH, but we Christians also need to BELIEVE and TRUST the TRUTH (Jesus). He’s with you! Do you believe and trust in that? I mean really believe it and trust it. If you begin to accept this truth, then I’m certain you are going to see many more of your friends, family, neighbours and workmates come to faith in Jesus Christ. It’s an Atheist’s nightmare when an Believer not only KNOWS the TRUTH, but BELIEVES him enough to share it. Why is it a NIGHTMARE for them? Because an Ardent Honest Atheist believes he knows there is NO GOD… He’s looked at all the available evidence and can’t find God. It’s not surprising to someone who knows God though, because we know they can’t see or know God for the simple reason they a BLIND and a blinded person cannot see. They are DARKENED in their understanding, because of their HARD HEARTS, so they cannot understand either. They are separated from the LIFE of God, so they are DEAD in their transgressions and sins. Oh my friends, if Christians can grasp this TRUTH, they’re going to see so many souls SAVED by Jesus. Those Dehydrated Souls Need The Living Water of God’s Word. So don’t get alarmed when you encounter an Atheist, get the compassion of Jesus and lead them into the light, let Jesus open their blinded eyes and soften their hardened hearts with the gentle word of the Saviour of the World. Like my dried mushrooms, plunge them into the WORD of God. Soak them in it and watch their understanding be expanded, watch the LIFE of God beginning to take shape and form in their WORD enlightened and softened souls. Amen! NOTE: I was given this message by the LORD today. I believe there are many Christians who need to know the power that is in them. So many of our brothers and sisters in Christ need the assurance and confidence to share Jesus. This world’s powers, infected by the Evil forces in the Heavenly realms, don’t want you to be sharing Jesus today. They hate it of course, that’s why a man, training to be a Social Worker, was thrown out of University because of his Christian beliefs, it seems you can’t be a Christian in Public office today in the UK. You can’t share your faith with a Muslim colleague either, a Nurse lost her job because she gave a booklet to a Muslim colleague and invited her to church. Oh my friends, the BATTLE is most definitely on, but don’t be SILENCED or feel threatened. 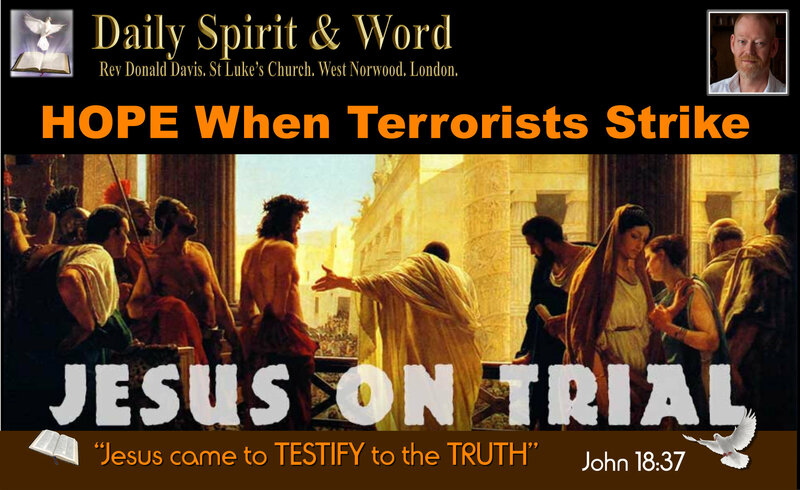 Jesus will give you the words you need when you are dragged before the Magistrates. He will be with you encouraging you and strengthening you in the BATTLE. The souls of those in the darkness are too precious to worry about the personal consequences of leading them into the light. That’s why Jesus said, “Take up your Cross Daily and follow me”… We are to die to self and live for Him. In verse 2: I believe that worship song is prophetic of our Nation today. All they need is JUST ONE, just one touch from the KING, then they’ll KNOW too. They’ll be set free from the deep darkness, blindness, separation from the life of God. Just ONE TOUCH FROM THE KING: The Lord Jesus Christ. His POWER is in YOU! Worship Song: “Just One Touch From the KING”. 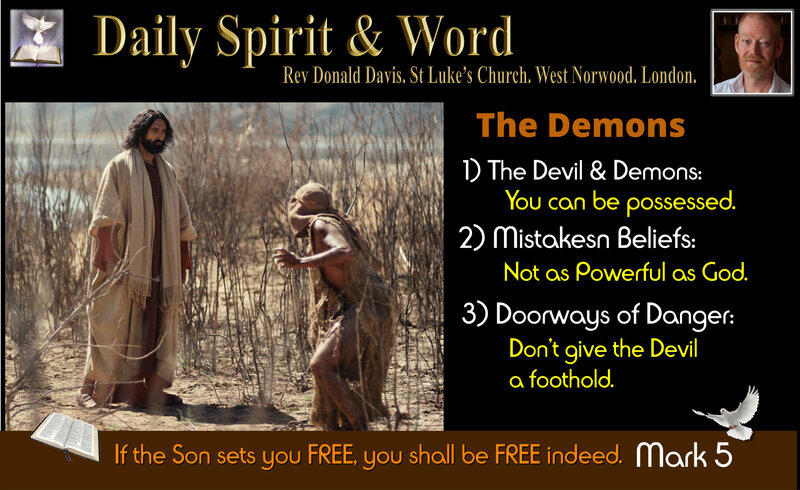 Daily Spirit & Word: 718: How To SAVE The World? Let Your Light Shine & Proclaim The Gospel. Good morning my friends, Way back in 2014, I did some teaching on the Tabernacle and the Lampstand (DS&W:187: Let Your Light Shine). Today, I’m adding a little more light upon that teaching. Jesus wants your light to shine, first before Him, but then BEFORE MEN. I’ve been sharing how when Christians are in the world, with people who don’t know Jesus as Lord yet, they are taking those people to CHURCH. Not the Church building, but because they are the Church, the Holy Spirit is in them. Well my friends Jesus wants you to let His Holy Light SHINE so that they can see God is real, alive and to bring them to the point of conversion so they will be able to glorify the LORD too. Verse 16 gives us the answer: “let your light so shine before men (people of the world), that they may see you GOOD DEEDS and PRAISE your Father in Heaven”… Awesome! So by just doing GOOD DEEDS people will see the light and come to the point of praising Father God. How can they be SAVED unless someone preaches / shares the Good News with them? My friends, there will be many a soul in Hell, who saw your good deeds and thought, “Mary is a really good and nice lady, but I never knew why, I wish she’d told me about Jesus and how I could be saved.”… We’re not to shine our light so that people will see how good we are, we’re to shine that light in such a way that people will KNOW how good God is. So that they will begin to Praise our Father in Heaven, not us. It has always meant to be Good Works: Kindness, goodness, faithfulness, love, joy, peace, patience, gentleness and self-control, but accompanied with and by the GOOD NEWS: How Jesus took us and cleaned us up, forgave us our sins and rescued us from sin, Satan and Hell. How Jesus has commanded all men everywhere to repent and believe the Good News. So often the ‘church’ has made the mistake of being one or the other: All Good Works or All Good News, but Jesus / God’s intention was that it was always, always meant to be BOTH. 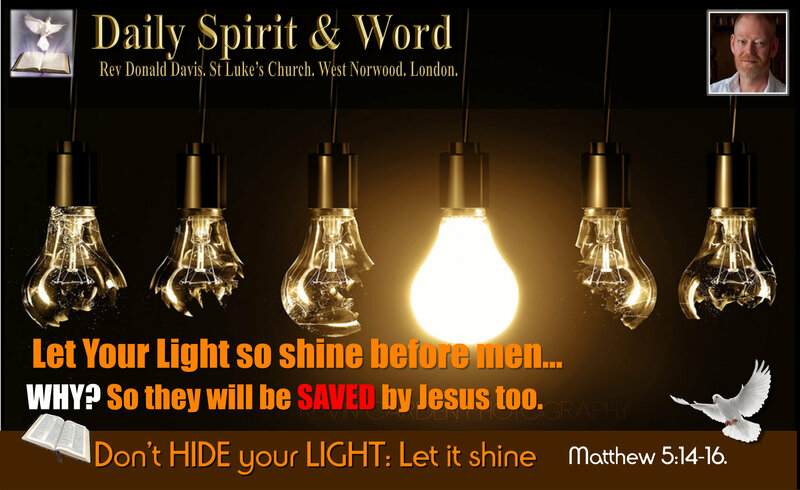 That is HOW we’re to let our light shine: Good WORKS and Gospel Good News. Remember again how Jesus sent the Demoniac back to his own OIKOS: That word ‘family’ below in the original Greek is OIKOS, it was not limited to just family, but to everyone who knew the man well, his friends, neighbours, those he worked with or for, everyone who knew all about him, that’s what OIKOS means. Just like that Demon Delivered Man, many of our contemporary Christian brothers and sisters want to STAY with Jesus in the boat of the church buildings. It’s so tempting, comfortable and nice to be just worshipping, praying, praising, but Jesus is still the same, He’s sending US out into the world to shine the light and share the good news. He’s still commanding you and me to go and let your light shine before men, so they will in turn PRAISE your Father in Heaven. This is a REVELATION to many of you I know. Jesus commanded His Disciples to GO into all the world and spread the Good News and make more disciples. The Delivered Man most certainly did “Let his light shine before men”… Not just in his home town but the whole area. My friends, if you’ve been set free by Jesus, if you’ve been set alight, on fire, ablaze, with His Holy Spirit, then you will be a shining light, people will see your good deeds, but let them know WHY? Why are you such a good person? Why are you doing so much good in the world today? It’s because of your SAVIOUR Jesus Christ and how He’s had mercy upon you. Let them know why and that Jesus wants to SAVE them too with the Good News. Keep your LIGHT Shining, be continually full of the Holy Spirit my friends, because the most important part of a Christian’s life is the part that only the LORD God Almighty sees. Be filled afresh with the anointing oil of the presence and power of the Holy Spirit today and you’ll be shining for Jesus Christ bringing Him glory by the good things that you do and the way you are sharing the Good News of the Saviour. God’s got so much good planed for you today. Enjoy the day in His mighty power. You might not SAVE THE WORLD or the whole world, but you’ll be letting Christ’s light shine on your own little part of God’s World. Let it shine! If the whole church is doing that, perhaps we can SAVE many thousands and millions of souls for Him. Amen! Prayer: I’m praying today for the whole Christian Church in the world. That we’ll all see Christ’s Command to Go OUT, the teaching in the light of all the Scriptures is His desire is that “EVERYONE” comes to repentance, let us not be the ones who’ve failed You LORD by simply worshipping, praying and praising You, when we know we should have been shining Your light and sharing the Good News in the world before men. O Lord Jesus we know You didn’t save the church to hide the light in a building, but to shine Your light in the world. O LORD! The harvest is plentiful and the labourers are few, send out Your Labourers into the Harvest Field of this world. Lord we want to see so many people that we know a love saved, please Lord, let them see the light and respond to the Gospel. Father, watch over Your chosen people and remind us often that we’re to do good works and speak out the Gospel with words too. Amen! Oh my friends, God’s longing to give you the Holy Spirit, we just need to claim what He longs to give us. First, we must be certain that we’re SAVED: I say this, because from experience many people have simply come to ‘Church’ thinking they are saved by being a worshipper every week and doing the things that the ‘real’ saints in Christ do. We’re not a Bus simply because we sleep in a bus-garage every night. Neither are we Christians just because we attend church regularly. Many people want the Holy Spirit, but don’t want to submit their lives to Jesus Christ as LORD. A) BELIEVED and TRUSTED in Christ’s DEATH upon the Cross for your sins? B) Have you REPENTED, which means letting go of all sin and begun to walk in His ways? 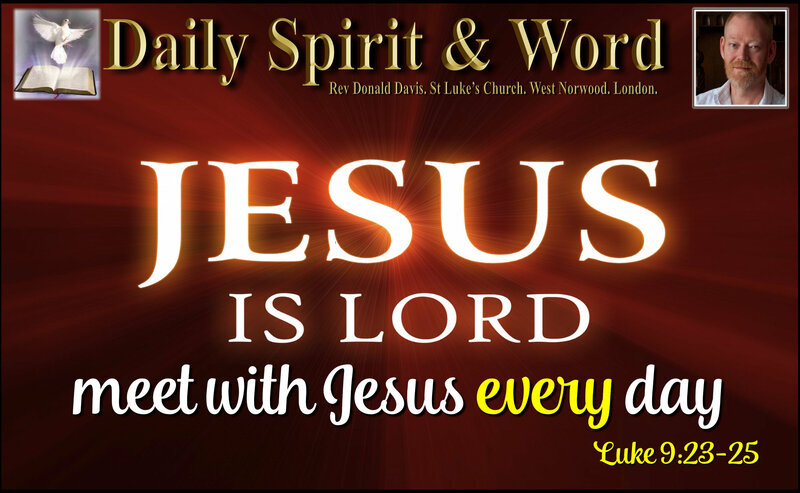 (If you are not sure you have, read the full Gospel CLICK Here and discover why you NEED Jesus as your Saviour). That’s what the Bible calls full salvation. Once you’ve trusted in Jesus like that, then you’ll be born again of God’s Holy Spirit. You will be filled with Holy Spirit, but we need to keep being filled. In order to be re-filled: All we do need to ASK to be filled. God will not give you anything extra unless you ask Him for it. Here’s how to begin: Pray: “O Heavenly Father, please send the Holy Spirit into my life and fill me up as much as I need, fill me until I overflow with His presence and power. In the name of my Lord and Saviour Jesus Christ I ask You my Heavenly Father. Amen” Your Heavenly Father longs to fill you my friend. Receive the Holy Spirit in faith and watch what He does in and through you throughout the day. Keep a journal and make notes of your prayers and petitions and your encounters throughout the day. You’ll be amazed what God will do in and through you. He’s longing to get you all fired up today. So many believers believe that being filled is automatic or a ONCE OFF event, but the LORD wants to give us so much, but so few seek and ask for what He longs to give. P.P.S. PLEASE PRAY FOR Anya. We met Anya whilst out sharing the Good News on the Streets in West Norwood, and she promised to come to church, which she did for the first time on Easter Sunday, then she came again two days ago on Sunday. Yesterday (Monday), as I was on my way to the Prayer Meeting, I met Anya who’d bumped into my wife, she was crying, as was my wife, Anya’s baby boy Alexander had died in Hospital that morning whilst undergoing a routine scan. Oh my friends, I can’t tell you the shock. I just embraced Anya. My wife and I prayed for her and continued to comfort her for a while. It’s amazing the PEACE the Lord has given to Anya, but it’s still very raw indeed. What amazing timing the LORD has, but we’re going to keep on praying He’ll bring Anya and her husband and extended family closer to Himself. Please also pray for us, the Christian Community and Family of the Lord in St Luke’s, that we can pour out His grace and love towards Anya. Amen. Sharing is Caring: Why we shouldn’t hide our light. The Light Shines in the Darkness: The people walking in Darkness have seen a great light. YOU Are the Church: How Christians have always been called to go and be the ‘church’ in the world. OIKOS. 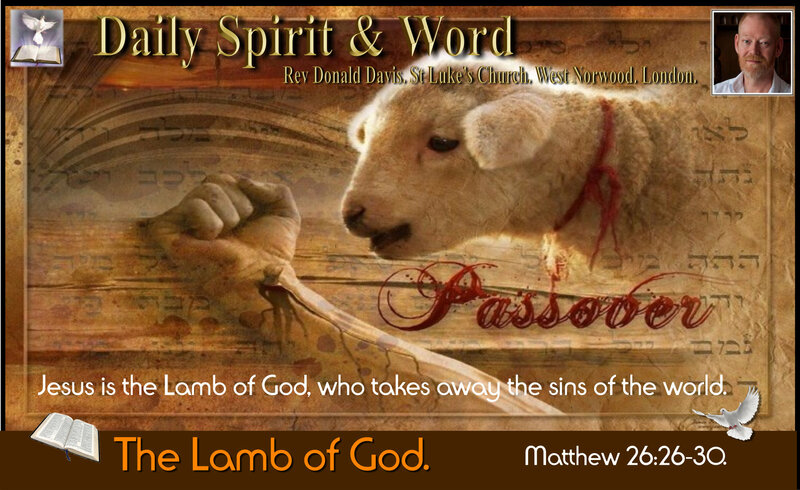 Daily Spirit & Word: 709: The Sacrificial Lamb. It’s the Sacrificial Lamb that takes away the sins of the whole world, the Lord Jesus Christ was that innocent, spotless, pure and holy Lamb of God. Good morning my friends, what an awesome evening of street witnessing last night. Our numbers of regulars on the team are growing. Praise the Lord! Last night; Ben and Judy, David and Sherrie and Matthew and Gemma came. Lloyd couldn’t make it, but he’ll be back next week. We did some training by watching Ray Comfort’s latest video. He was preaching at a Youth Evangelism Conference: His teaching was about “The Greatest Sin in America Today”… You’ll have to watch it (Link at bottom of page). If Jesus was God, then did God die upon the Cross? If you say, as we do that there is only ONE God, then how can Jesus be God and the Father be God, that doesn’t make sense to us? These were really great questions; but then came their statements of what they believed: That Jesus was just a prophet, he died, he didn’t rise from the dead, but we believe he’ll come back again after another prophet Mohammed. We don’t believe that Jesus was God. Changed the subject: Into a presentation of the Gospel. Each one thought they would. It’s helpful when you have a large crowd to ask each person listening individually, I did this quickly by saying, “What about you?” Then I asked why will you get into Heaven? They all said, “God will forgive us if we say we’re sorry for sinning”… Some added “Genuinely sorry”. I said, “That’s just so typical, not just of Muslims, but everybody who doesn’t yet know Jesus Christ. Nearly everyone believes that God will forgive them anyway, no matter how they’ve lived, if they are sorry for their sins. Most people believe they are already good enough for Heaven, i.e. they’re not so bad as to deserve Hell forever. My next statement got their attention: “God will not forgive you just because you are sorry for sinning”. There was a shocked look on some of their faces. I asked them, “What happens to a person caught in the act of stealing in the Middle East?” They all said, “They’ll get their hands chopped off”… Why? “Because it’s Sharia Law”… I said, “That’s right, Sharia Law is Just and must punish those who do wrong, just like UK law, but we don’t chop-off their hands.”… You can bet that every thief caught stealing in the Middle East is “Sorry for Stealing”, because they know they’ll loose their hands, right?” Then I said, “God is far more just than any earthly legal system; In His Holy Righteous Judgement, He’s already stated, “The Soul that sins shall die” no sinner can enter into His Holy Heaven” It’s amazing, they all nodded in agreement. But they then went onto re-state their beliefs, “God will forgive us if we are genuinely sorry”… Most of them were still trying to justify themselves, but not all by now. I said, “Listen my friends”, I asked each one their names, and continued, “Even if we’re genuinely sorry for our sins, God cannot just forgive us, He must punish sin, if we’ve not had our sins removed from our souls before we die, then we die carrying those sins with us to face God on Judgement day. “It’s like a thief appearing before a High Court Judge, admitting “guilty as charged your honour, but I’m really sorry”, then the just earthly Judge will say, “Good, I’m glad you are genuinely sorry, I’ll take that into consideration when passing sentence, but I must also punish you for your crime”… A just earthly judge will pass a fine or a term in prison. A holy and righteous God has already revealed what the punishment will be for any sin, eternity in Hell with Satan and his demons. The soul that sins will be cast into the lake of fire with Satan. “Have you ever stolen something?” They all admitted they had. I said, “The Bible clearly states that no thief can enter into God’s Holy Heaven”. God’s standards of Holiness are far higher and out of reach than our own, so of course we want to justify ourselves. We don’t want to go to Hell do we? Can you see my friends, it’s the LAW of God, the Commandments of God, that shuts the mouth of self-justification, because like a good schoolmaster it leads people to a knowledge of how they’ve sinned against God and their need of a Saviour, i.e. someone who’ll take away their sin and save them from God’s wrath and judgement to come. Jesus Christ is the Lamb of God, the only pure and holy sacrifice, who takes away the sins of the world. When we put our faith and trust in Him, then all our sins are washed away. When we get baptised we’re showing the world we’ve trusted in Jesus, we’re dead to our old way of living and when we come-up out of the water, we begin to live the new life in Christ Jesus. We’re filled with God’s Holy Spirit, who comes into our soul, gives us New Birth and enables us to live a holy life that pleases God. Because of the Lamb of God, Jesus who died upon the Cross, His blood cleanses us from sin and enables us to enter into Heaven when we die. Praise the Lord! We have passed from death to life. We may never know what will happen with those Muslim young men, I’m praying the Lord will give them; Faith to believe in Jesus Christ, Repentance from Sin, New Life and Eternal Life… Will you join me in prayer for them now? As we shook their hands, they wanted us to stay and answer more questions, we invited them to come and join us on Alpha. Tonight: We’re celebrating the Lord’s Last Supper as we gather in Church. We have all the elements of the traditional Passover and read from God’s Word about the Israelite’s first Passover, then teach about Jesus new meaning of the blood sacrifice from the Gospels. Matthew 26:26-30 (NIV) Jesus’ Last Passover Meal. 27 Then he took the cup, gave thanks and offered it to them, saying, “Drink from it, all of you. The Blood of the New Covenant: Jesus blood sacrifice upon the Cross was to remove and cleanse, to wash away the sins of everyone who trusts in Him. 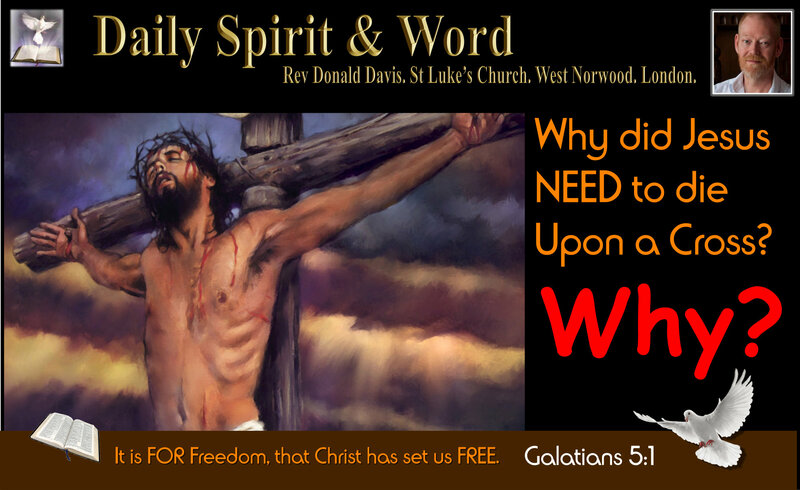 Why do we need our sins washed away? If we died without being cleansed then we’d still be in our sins and we’d face God’s righteous judgement. So my friends, TRUST in Jesus today: Believe that He died for your forgiveness, Repent (renounce and let go of sin), Receive Jesus Christ as your own Lord and Saviour, then LIVE the new life that He’ll give you as you are born of His Holy Spirit. Have an awesome weekend of celebration of all that Jesus has done. NOTE: Ray Comfort’s Teaching: “The Greatest Sin in America Today“. It’s not just America’s Greatest Sin, but the sin of a growing number of people in the world today. 1. What is it that the Bible says is “perfect, converting the soul”? It is the Law of the Lord which is perfect for converting the soul. 2. According to the Bible, what are four functions of the Law? A. Brings the knowledge of sin. B. 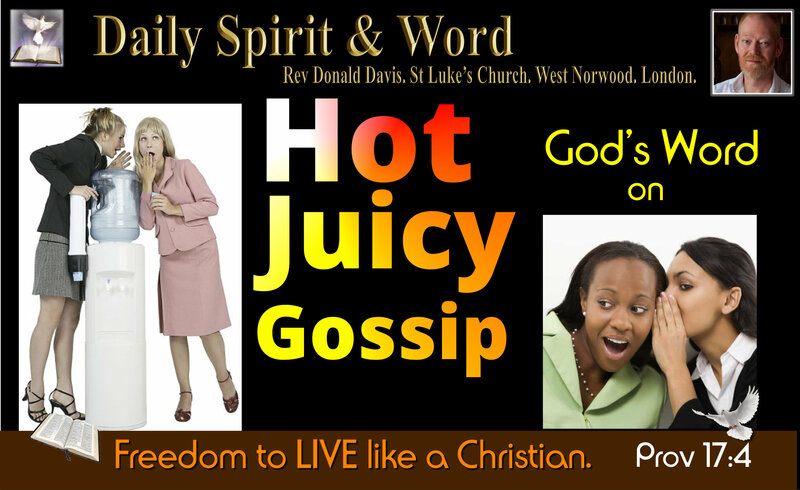 Stops the sinner’s mouth from justifying itself. C. Helps the world to realize that they are guilty of sin by breaking God’s Commandments. 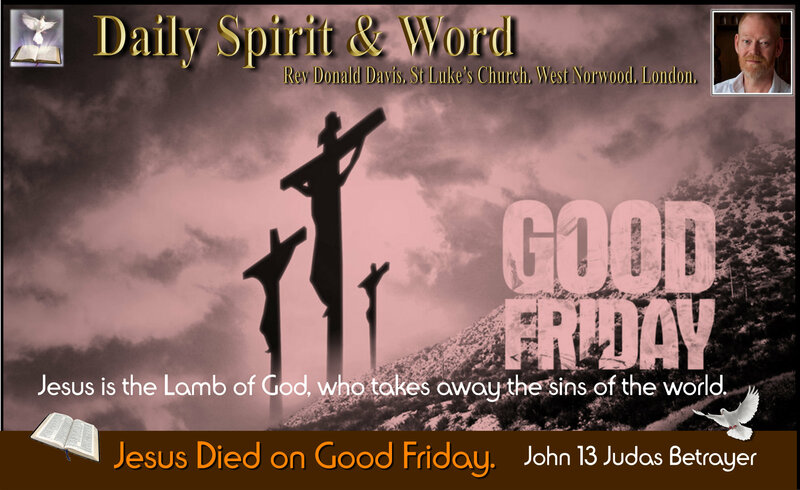 D. Acts as a schoolmaster to bring us to a knowledge of our need of Jesus Christ and His atoning death upon the Cross. 3. What is the biblical definition of sin? The biblical definition of sin is anyone who has broken God’s Law. Romans 3:20 tells us that “by the law is the knowledge of sin.” The straight edge of a ruler will always show the crookedness of a line. A lamb looks white against a green backdrop of grass, but in a snowy field that dirt upon the lamb is revealed. Dust in the air is invisible until you open up the curtains and let the sunlight in, then you’ll see millions of dust particles floating all around. So the LAW shows the sinner his true condition before God. 4. Who is the Law designed for? The Law is designed for the lawless and disobedient, for the ungodly and for sinners, for unholy and profane, for murderers of fathers and murderers of mothers, for manslayers, for whoremongers, homosexuals, for kidnappers, for liars, for perjurers, and any other thing that is contrary to sound doctrine. 5. What has modern evangelism chosen to attract sinners to the Gospel? q Fill that “God-shaped vacuum” in your heart. q Give you true happiness. q Get you out of financial difficulty. q Heal a broken relationship with your spouse, etc. q Take away that addiction problem. Give you last, happiness, peace and joy…. 6. What happens when all the promised “benefits” don’t arrive? “Accepting Christ” for the promised “benefits” is simply the wrong reason to do so – it is unbiblical. When the promised benefits fail to arrive, disillusionment and bitterness will grow against God and the person who witnessed to them. This makes it very hard to reach a person who thinks they’ve been ‘born again’ when they’ve really only tried a form of religion, i.e. they were false converts from the start. 7. Why should a person accept Jesus Christ as their Saviour? Use the Law to show a person their depravity and the appointment they have with death, one which they will not miss. Unless they repent, and put on the Lord Jesus Christ, they will die in their sins. They need to know that they are an enemy of God through their wicked works and that God will judge them in righteousness. By simply using the Law of God, revealed in His Ten Commandments, and showing an unsaved person their need for a Saviour, it opens the door for us to share how Jesus Christ is the Only Good News for a soul on it’s way to Hell. The Law also reveals the desperate condition of people in this world, they need a Saviour, who’s going to go out and seek and save the Lost?